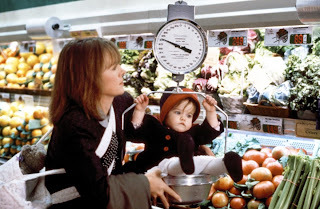 A sharp comedy probing the status of women in the work place, Baby Boom asks whether a woman can have it all. The answer is a yes hiding in a no, throwing doubt on the definition of "all". Baby Boom is a smart and funny cultural milestone. Management consultant J.C. Wiatt (Diane Keaton) is a rising star at her New York firm, consumed by work, living the fast life, achieving success, and on her way to achieving the coveted status of Partner. Life is turned upside down when a distant cousin dies and leaves in J.C's care an unexpected package: a cute toddler named Elizabeth. J.C. briefly considers giving the child up for adoption, but a bond forms quickly. She tries to juggle motherhood with her work, but her performance suffers and her equally work-obsessed live-in boyfriend (Harold Ramis) leaves to find a diaper-free environment. J.C. is eventually forced to accept humiliating work assignments and makes the decision to quit. She relocates to an old country house in Vermont, where her new life also includes a fresh business venture and some unexpected choices. With the decade of greed in full swing and the movie Wall Street (also from 1987) offering a distorted definition of success, Baby Boom pauses and checks on society's priorities. It's a brave move from the writing duo of Nancy Myers and Charles Shyer to throw a baby into the hands of a high powered executive and alter her life trajectory for the better. That J.C. discovers the potential for her world to be a richer place with more Elizabeth and fewer meetings makes a statement, and offers a perspective not often championed. Baby Boom is one of Diane Keaton's career peaks, and she excels in three dimensions. As the high-performance executive known as the Tiger Lady, Keaton gives J.C. a dominant presence, with the slightest twinge of self-doubt below the surface. 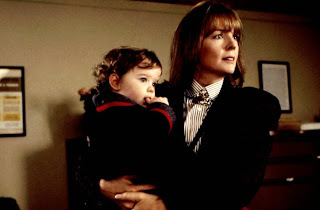 Keaton then handles the awkward transition from executive to working mom with plenty of skillful comic timing, literally juggling baby and work, getting torn between two priorities. And when J.C. explores her new zone of potential comfort in Vermont, Keaton fights a rearguard action, clearly falling in love with a new reality but with lingering twangs of pining for the power suit. Shyer directs with an eye for strong parallels, the sharp black edges of New York underlining J.C.'s rocketing pre-baby career trajectory, the softer, colour-rich environment of Vermont welcoming a new, softer, slower but no less rewarding phase of her life. The country bumpkin elements are slightly overplayed as J.C. adjusts to the pace, but the film always places its heart in the right place. Baby Boom's one weakness is the absence of any meaningful counterpoint to Keaton and the J.C. Wiatt character. Harold Ramis as her initial live-in mirror image is transparent in both personality and presence, to the point of effective invisibility. Sam Shepard's rustic rural veterinarian arrives late and only ever hints at the romantic charms to be found in the countryside. The almost uniformly all-white, all-male power brokers in J.C.'s executive life include Sam Wanamaker, Pat Hingle and a young James Spader. They make the point about the homogeneity of men attempting to define what constitutes business success, but remain perhaps intentionally interchangeable. Life can take unexpected turns, and variants of success can be found in the company of unexpected packages. Baby Boom is brave enough to weigh Partner against Mother, and succeeds as both comedy and social commentary.